I have to hand it to Angelina Jolie for what she has done with Unbroken. It’s a damn fine WWII that’s handsomely produced and well acted. Sure, it’s a tad overlong and slightly predictable but it holds together well and hits all the right marks. I’m not sure why but I didn’t really want to like it, but it won me over and I simply have to give credit where credit is due. Jack O’Connell plays Louie Zamperini, a real-life Olympian athlete who was shot down over the Pacific Ocean during WWII. He spent 47 days in a life raft in the ocean, only to be picked-up by the Japanese and put into a concentration camp. There he was abused by Mutsuhiro “Bird” Watanabe (Takamasa Isihara), an evil sergeant angered by Zamperini’s sporting prestige. Unbroken ticks all the right notes for being awards bait, being a true-story where the protagonist overcomes incredible odds and maybe in a weaker year it could have won a lot of awards. The talent is there but it just didn’t break through in a year which saw Birdman, The Theory Of Everything and The Imitation Game. Jolie’s film still banked $115 million in the US and over $161 million globally, making it an impressive hit and a crowd pleaser. It’s a fine motion picture, even if the stand-out moments are in the first half. Angelina Jolie surrounded herself with some impressive top-tier talent on Unbroken and it pays-off on a technical level. Master cinematographer Roger Deakin shoots the film with a wonderous golden glow, Alexandre Desplat’s emotional score undercuts the onscreen action and the script by Joel and Ethan Coen and Richard LaGravenese and William Nicholson script (adapted from Laura Hillenbrand’s book) ties the many elements of Zamperini’s life together in a way that never feels too much like a traditional biography. 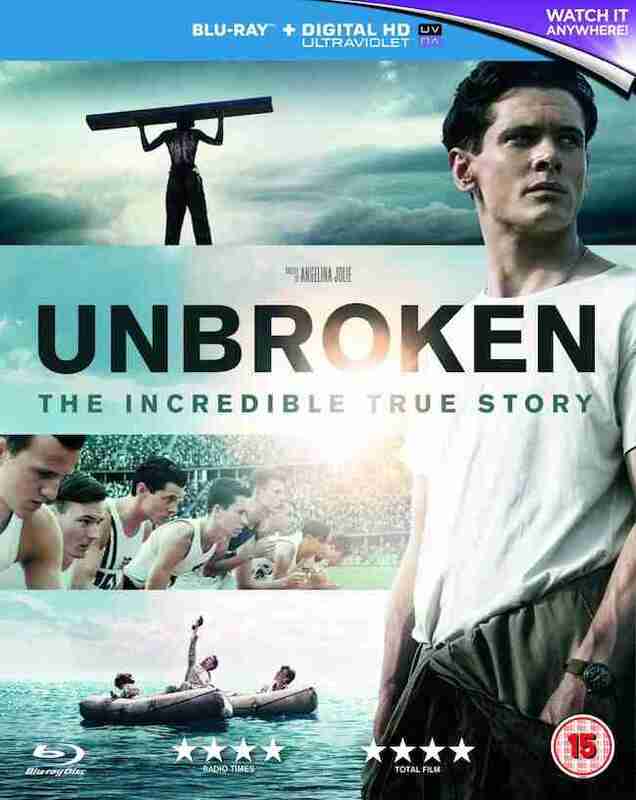 The cast of Unbroken also excels with O’Connell making a powerful breakthrough in the lead role. He transforms in a physical and emotional level onscreen, delivering a wonderful performance – even if he never truly convinces at being an Italian-American. Domnhall Gleeson, Jai Courtney and Garrett Hedlund also impress and Takamasa Isihara delivers a sleazy performance as ‘Bird’. The first half of Unbroken is undoubtedly the best segment and the second half does fall back on the usual POW tropes as Zamperini struggles to overcome adversity to raise up against the emotional a physical hardships thrust upon him. It all feels a touch too noble but Jolie never makes it feel too saccharine. It’s all well done of course, but everything else is so first rate, that you feel it should transcend these stereotypical tropes. However, Zamperini’s true life struggles are what they are and if that’s the story, then so be it. Unbroken is impressive Hollywood filmmaking that tells an incredible true story. Angelina Jolie impresses behind the camera and shows that she might well have a great career behind the camera. Unbroken is worth the blu-ray premium because it really makes the Roger Deakin’s photography pop. The disc comes with documentaries that cover the film’s production and Louie Zamperini’s life. You also get deleted scenes – a good package.